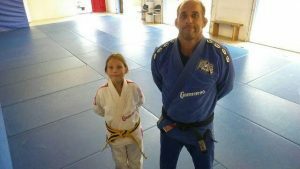 Victor Huber and his daughter Kayla at his academy in Atlantic Beach, FL. Victor Huber is a native of Rio de Janeiro, Brazil. He began training Gracie Jiu-Jitsu at the age of 7, and he has trained several years in judo. He was promoted to black belt by Royler and Rolker Gracie at the Gracie Humaita Academy. He currently holds the rank of 5th degree black belt. In addition, Victor holds a degree in finance from the Universidade Federal Fluminense. Victor has made Jacksonville his home since 2005. He is also a proud U.S. citizen, receiving his American citizenship in 2018. He is proud to represent Gracie Humaita in North Florida. He may be reached at 904-588-5903 or by email at victor_huber@hotmail.com.